Who or what is your kryptonite? Last weekend, friends of mine went to see the new Superman movie Man of Steel (don’t worry – this story has a purpose). My friend Kate was mulling over the fact that kryptonite, as a destructive element, is so ironic. Wasn’t it kind of absurd, she explained, that the very thing that was Superman’s ONE true weakness was found on his home planet? That the very thing that could undo him was so close to him every single day of his life? I didn’t think much of Kate’s statement until I finished my re-watch of New Girl’s “Kryptonite.” And then, that conversation replayed in my mind. Isn’t it intriguing that Jess’ weakness – her kryptonite – is the very thing that had been closest to her for six years – Spencer? Maybe it’s not ironic at all; maybe it actually makes complete sense. But I often think about weaknesses, about our external enemies, as things or people we keep at arms’ length from our lives. A vice isn’t something we want to keep close to us, after all. It’s something that we KNOW is terrible for us (be it junk food or an ex-boyfriend or Keeping Up With the Kardashians) and try to rid ourselves of. But kryptonite is different – kryptonite is something you are close to, something you surround yourself with, and something that could – if used as a weapon – destroy your very existence. Spencer isn’t a terrible person, necessarily. Yes – he cheated on Jess which was terrible and gut-wrenching. But there was never any evidence to suggest that Spencer mistreated Jess in their relationship. He seemed aloof and lazy, but not malicious or violent. We wonder, just as the loft guys do, exactly WHY Jess is so completely undone by Spencer until Nick explains the concept I noted above: Spencer is Jess’ kryptonite. He’s toxic because of how close Jess allows him to be in her life, still, in spite of their catastrophe of a break-up. And really, that’s what “Kryptonite” is all about, at its core – the idea that relationships can be toxic and disastrous… only if we ALLOW them to be. They can also be gratifying and loving (Jess/the loft/Cece) or full of respect-ish things (Schmidt/Winston). In case you were too busy scanning the pawn shop for some good bargains and forgot the plot of this episode, never fear because I am here to recap! Coach has moved out of the loft, which means that the guys are welcoming back Winston, their old friend, into the apartment. Winston, Jess learns, has been in Latvia playing professional basketball for a few years. Ignoring Nick’s warnings that Winston is hungover and doesn’t want to be awoken, Jess greets her new roommate with singing. LOUD singing. I’ve always enjoyed the Winston/Jess dynamic of this show, even though it hasn’t been explored as much as some other relationships. At the beginning of the series – truly, in this episode – Winston doesn’t quite understand Jess as a person. He barely seems to tolerate her and finds her odd at best and downright obnoxious at worst. The fact of the matter is this: they don’t have a lot or ANYTHING in common. Winston is the straight man throughout “Kryptonite” and in fact, the moment where he breaks through that wall, the moment that propels him into non-straight man territory is the moment he finally accepts Jess. And it’s really quite beautiful, because Winston is this character who has spent the past few years being isolated from his close friends. I think, in a way, he’s kind of forgotten that absurdity that friendships sometimes adopt. But being with Nick and Schmidt and Jess has made him realize what lengths they’re willing to go to for one another. And it makes Winston, in turn, embrace Jess as a roommate and friend. The episode opens with Schmidt stopping Jess as she walks by his room by asking her where in his room he looks the sexiest. Nick passes by the room while Schmidt rotates between his three options, and he and Jess decide to mess around with their roommate and make fun of his question. My good friend Jaime and I have discussed how much we adore Nick and Jess together, and I’ve probably said it (and will say it) a million times more throughout the course of this series, but I DO love the Nick/Jess dynamic. One of my favorite moments is the beginning of this episode, where Nick and Jess are messing around with Schmidt. They have such a rapport with one another and a sense of camaraderie that is quite adorable. I think that, apart from just looking and acting cute, Nick and Jess begin this series truly understanding where the other person is, emotionally. And that, to me, makes all the difference in their relationship. The next morning, Jess is making breakfast and excitedly discussing their new roommate with Nick. The man warns her, however, to leave Winston alone – he went out the night before with the guys and was both jetlagged and hungover. Jess, ignoring his warning, takes breakfast into Winston’s room and then decides to sing her introduction. One of the things that I noted in my last review was how much Jess has evolved as a character throughout the series. She began as this absurd, quirky, somewhat childish woman who acted weird all the time. But, the writers and producers thankfully chose to focus on a few things that made Jess UNIQUE rather than WEIRD as they continued throughout the series. And that childish air that she exhibits in the first few episodes evaporated faster than you can sing the New Girl theme song. I’m really quite impressed by how subtly they developed Jess, though. Instead of cutting out everything that makes her unique as an individual, cold-turkey, the writers slowly began to incorporate more elements that make Jess relatable. And I think that this is truly the key to a successful series: viewers need to find aspects in the main characters’ lives that they can relate to. Jess was a bit weird in the beginning, but once we understand WHY she’s quirky – what, in her life, has occurred to make her this way – we can relate to her more. Meanwhile, Schmidt is jealous of Winston moving back in because he had come to think of himself as the “top dog” in the loft. The re-introduction of their former roommate makes Schmidt insecure throughout the entirety of the episode, even though he insists that he isn’t. Later in the bathroom, Winston enters and asks Nick: “What have you done to me, Nick?” And I do, of course, think that this is how Winston feels upon entering the loft: like Nick has thrust him into some circus-like living environment where he is the only sane one. Truly, Nick is the only person that Winston trusts and values when he moves in, because quickly the athlete schemes to take his old room back from Schmidt. Elsewhere, Jess is raiding Schmidt’s “lost and found” for something to wear because the vast majority of her clothes are still with Spencer. Nick insists that he’s been telling her for weeks to get her stuff back from him, but Jess is having a difficult time with the concept. What I really love about this episode – and the Nick/Jess aspect of it – is that Nick is the one who is encouraging Jess to make moves and get closure. The parallelism is, of course, that the week prior JESS was the one encouraging NICK to seek closure with Caroline. The fact that both of these roommates are on the same emotional and relational journey is perhaps the most integral part of their relationship as roommates, friends, and then – eventually – romantic partners. Unfortunately, Jess winds up dribbling the basketball that the guys are playing with straight into the roommates’ television set. Whoops. The men encourage her to find a solution, and Jess admits that she DOES have another television… but it’s at Spencer’s house. But Jess’ problem lies in the fact that Spencer is her weakness, her kryptonite. The reasoning that she first gives to the men for not wanting to see Spencer, however, is that she wants to remain friends with him. Nick is flabbergasted – she should not want to remain friend with her ex. Schmidt is the one person to always try and talk to Jess in the most calmly rational way. He’s the one who approaches her in the pilot about getting a rebound. He’s the only one who manages to get her off the couch, out of the pile of used tissues, and back into the world. In “Kryptonite,” he attempts to talk to Jess rationally but can’t actually find the words. Instead, Nick and Winston loudly berate Jess to talk to Spencer and get their television for them. Jess promises to do just that (rather unconvincingly, might I add). Jess DOES meet Spencer at a park (who calls her “Jess Jess”) and I’ve kind of wondered exactly what it was that drew Jess to Spencer in the first place. We don’t know much about him, truthfully, apart from the fact that he cheated on her and seems to be in a perpetual state of obliviousness. But we DO know that Jess stayed with him for six years, coasting along in their relationship. She notes at the end of the episode that she eventually would have married him and settled, just because. It’s pretty telling, knowing this aspect of Jess’ character, because we realize that while she did truly care about Spencer, a part of her was probably always scared to leave the relationship because that would mean starting over. Jess is afraid of the unknown, just like all of us, and to move in with a trio of complete strangers was terrifying for her. But even more terrifying is letting go of the past because it means that she no longer defines herself by it. Maybe Jess and Spencer had a really goofy relationship. And I’d surmise by their interactions and his nickname that they DID – their relationship likely began when they were younger and more carefree, and that aspect of Jess’ character transcended the relationship. So, when she moves into the loft, she doesn’t quite know how to behave in any other way than how she has for the last six years. Her life was defined by Spencer, her actions were characterized by their quirky relationship, and when that is stripped away, Jess has a decision to make – does she remain as she once was or try to move forward and perhaps grow up and out of that relationship? In a diner, Winston, Schmidt, and Nick are discussing the concept of “top dog” once more, with Winston announcing that clearly Schmidt has become top dog in his absence. Nick agrees and it’s all a set of mind games to get Schmidt to give Winston his old room back. It’s clearly working at the beginning of the conversation because Schmidt is a bit confused. Jess and the clueless Spencer are discussing Rochelle (the woman that Spencer cheated on Jess with), when Jess asks for her stuff back. She is confident and assertive, but that resolve begins to crumple once Spencer makes excuses for why he can’t give her items back to her. He is Jess’ kryptonite, and as a person Jess lets people take advantage of her quite easily. She doesn’t understand how to say “no” to people, in general, and definitely has a difficult time denying Spencer anything. He takes advantage of this weakness and exploits it in order to get Jess to drive his girlfriend to the airport. Later, Jess goes to a pawn shop in order to try and get a television for the apartment. Having virtually no money proves detrimental for her, however, and she cannot purchase one for the guys. Back at the loft, Schmidt is still struggling over whether or not he’s top dog in the loft. He confronts Nick who (let’s be honest) lies through his teeth and claims that yes, Schmidt IS the shot-caller of the loft. Jess and Cece return to the loft, where Nick (and I’m not reading into this, I promise) looks at his emotional roommate in concern. Even Schmidt appears worried, which I think is especially endearing. Lest we forget that everyone else in the loft cares as much about Jess as Nick does, I am here to remind you that they DO. Nick and Schmidt are appalled that Jess let herself be taken advantage of, but Nick is conscious of the reason she has – Spencer, he deduces, is her kryptonite. And the only way to rid herself of him is to fight back. I love that Nick is the one to encourage Jess to fight for closure and stand up for herself. I love even more that Schmidt and Cece watch Nick and Jess in this scene, and something visibly clicks with them both: Nick is the only one who can get through to Jess. They listen to each other; they help each other out; they support each other. And again, that’s not to say that Winston and Schmidt don’t care about Jess. They truly and honestly do. Nick is more emotionally connected to Jess, however, and THAT is the reason why his friendship with her has an additional layer to it. Nick’s belief that Jess doesn’t, on a subconscious level, want to get her stuff back from Spencer because then she has to accept the fact that the relationship is over is quite true and also so important. He KNOWS what she’s going through because he went through it only a week prior with Caroline. He understands how she feels, not wanting to let go completely of the past. The future is scary, to Jess. It’s scary to all of us. But the fact of the matter is this: Jess needs to fight in order to embrace the future. And that means closing some doors (see: her relationship with Spencer) that can never be re-opened. I really love that Nick makes his case, Cece backs him up, and then Schmidt agrees with Cece. It’s this nice cycle that Jess watches unfold. She, however, is still adamant that she really IS over Spencer and does want to move on. The scene that follows is SO perfect because Nick goes a step further in encouraging Jess. He MAKES her punch a pillow in order to get her anger out. He wants her to get mad, to fight for herself, and then – as she is set to leave – explains that he’s proud of her. Cece and Schmidt also cheer her on, which I think is fantastic. The group then drives together (including Winston) to Spencer’s place so that Jess can retrieve her belongings. She blasts loud, angry music on the way there… only because it’s a part of Winston’s pre-game mix. The group insists that Jess be confident, strong, and assertive when she approaches Spencer and not let him lure her with his charm. Every time Jess approaches the house, however, she speeds up and explains that she needs to drive around one more time to clear her head and prepare herself. In the back seat of the car, Schmidt and Winston are arguing over who is top dog, truly. When Schmidt announces that things have changed in the loft, the dynamic has shifted, and Winston is no longer in charge, Winston renounces his “top dog crown” and places the imaginary crown atop Schmidt’s head. The man then promptly throws the invisible crown out of the window. But what their storyline boils down to, Schmidt explains, is this: respect. He doesn’t believe that Winston respects him, doesn’t believe he ever will, and that actually wounds Schmidt’s pride and ego more than having to give up the big room. Winston is still baffled by this nonsense and by Schmidt in general, so he says nothing. Jess finally approaches Spencer’s door and… quickly falls under his spell and charm once more. Instead of being assertive, Jess hugs Spencer. All hope of the boys getting their television seems lost until Jess notices, out of the corner of her eye, an un-watered plant. This, interestingly enough, is the ONE thing that snaps Jess. She asked Spencer to water the plants and he refused. Suddenly everything makes sense to Jess – Spencer will continue to take advantage of her if she lets him and she just cannot allow that to happen anymore. So she charges into the house and ransacks it to find her stuff. The boys and Cece sit in the car and Nick wonders aloud whether Jess will be all right in there by herself. While they wait with bated breaths, Jess emerges victorious with piles of clothing and a television. Out in the lawn, Jess noticed Spencer’s shirt. Actually, it’s HER shirt that he stole and she demands it back. When Spencer refuses, Jess lets the television fall to the ground (screen side up, thankfully) and lunges forward. Nick holds her back as the two other men rush forward to gather her stuff. When Spencer refuses to give back the shirt that Jess worked hard for, Nick challenges him to give it back. This is the first moment (this entire scene) we really get a chance to see how protective the loft boys are of Jess. 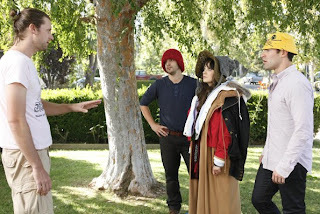 Nick swipes a hat from the ground that Spencer claims he has rights to and places it on his head, daring him to try and take it off. Schmidt does similarly, while Winston – in the background – claims that the men look ridiculous. But I love that once Schmidt and Nick start passionately defending Jess, Winston slowly moves toward them, curious. Note: Winston contemplates, visibly, Jess’ words and moves toward her when she utters the line about starting over. Because the truth is that WINSTON has to start over, too. Those words resonate with him. He doesn’t know who he is, really, or how he fits in with the new loft dynamic. He was trying to return to his old, familiar position of power but has to accept that he may not be “top dog” anymore. And once he finally accepts this, he dons a hat and helps defend Jess. Spencer, however, is still adamant on keeping the shirt. Until Schmidt slaps him. Cece emerges from the house with all of Jess’ belongings while Nick and the others help her load up the car. In a final moment of triumph, Jess finally insults Spencer the way she’s needed to and her friends fist bump to her success. Back at the loft, Winston – impressed – talks to Schmidt about how he slapped Spencer and officially declares Schmidt to be top dog of the apartment. He honestly and truly has respect for Schmidt for standing up for Jess and isn’t afraid to admit that. Of course, Schmidt thinks that this compliment is just another mind game of Winston’s and renounces his large room, taking back his old room to prove his “top dog”-ness. Winston is baffled but relieved to have his old room back. As Nick sets up the television (with duct tape, I might add), Jess comments on how excited she is to have all of her stuff back. Nick notes that most of her stuff is broken, to which the woman utters: “Yeah, it is broken but… I don’t know. It’s mine.” And I think that of all the statements Jess could make, this is perhaps the most profound. It doesn’t matter to her now that her life isn’t perfect. Some things are broken and awaiting repair; some things might never be repaired. But her relationships are intact – she has three guys and a best friend who care about her – and truly, no matter what happens, those things are HERS. And that’s all that matters. - “Jess! Look! It’s a ball.” I absolutely love that Schmidt tries to distract Jess like he would a dog when she gets too emotional. Hope you all are enjoying your summers and our #SummerRewatch series! This Tuesday night we head to Nick and Jess' first wedding as a (fake) couple when we re-watch "Wedding." ;) Until then, folks! as you know i am a fan of you and your reviews i would like to know if you have the other reviews of season 1 and season 2 here or anywhere else? Hope you can answer it!